See the sunrise over Tampa Bay as you run the 15K, 10K or 5K paved-trail courses. Starting at North Beach, these are pure out-and-back tour of Fort De Soto. This barrier-island flat, scenic half marathon, 10K and 5K courses loop entirely through beautiful Fort De Soto Park, recognized as the nation’s #1 beach. Costumes encouraged! Jingle all the way to the finish line on the picturesque, mostly flat, Madeira Beach-to-Largo half-marathon and10K course with a holiday finale at Taylor Park. Santa joins in on the fun at the awards ceremony. A Marathon, Halfathon, 10K and 5K Run/Walk make this running event accessible to athletes of all levels.The courses take you by St. Pete’s sparkling waterfront, beautiful historic neighborhoods, and the shaded Pinellas Trail – a paved, rails-to-trails linear park. The Marathon is a Boston Qualifier. 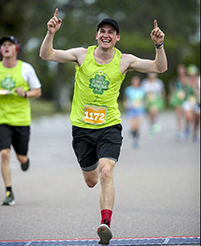 Put on your green for this perfect spring-break race at Florida’s beautiful Fort De Soto Park. Flat, paved trails, a breathtaking sunrise, and a fun finish-line celebration make this half-marathon, 10K or 5K the one to run in March. Florida Road Races offers 5 runner and walker-friendly races throughout beautiful Tampa Bay. From 5K, 10K, and 15K races to Half- Marathons (Halfathon) and a Marathon, there is a distance for everyone. Join us during our 21st year of organizing some of the best races in Florida! 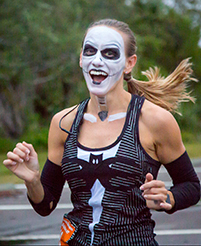 Created with every level of athlete in mind, we now offer the Halfathon, 10K, and 5K Challenges as well as the Fort De Soto Triple Crown – four different race series starting in September and ending in March. Can’t make the race in person? 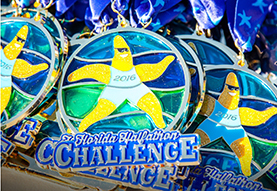 No problem – run the race on your own time; earn one of our coveted finisher’s medal. We’ll mail your medal and bib. Net proceeds will be donated to local non-profit organizations. We’re located in the beautiful Tampa Bay area, with races in St. Petersburg, Fort DeSoto Park, Madeira Beach and Largo.